Product prices and availability are accurate as of 2019-03-01 16:34:30 UTC and are subject to change. Any price and availability information displayed on http://www.amazon.com/ at the time of purchase will apply to the purchase of this product. 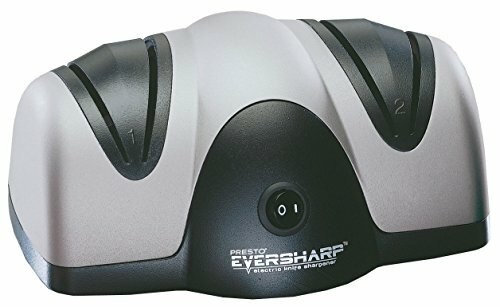 The EverSharp electric knife sharpener provides an easy, automatic way to sharpen kitchen and sporting knives to a razor-sharp edge. With a professional two stage system, it precision grinds a perfect sharpening angle then fine hones and polishes the edge. This Presto knife sharpener uses Sapphirite sharpening wheels, the same ultra-hard material used in professional sharpening shops. No-guess blade guides automatically hold knife at the ideal sharpening angle for perfect results every time.